﻿﻿On the southern end of California, in Imperial and Riverside counties, lies a jewel of the nation: the Salton Sea, the largest inland lake in California. Tourists from around the nation come to this desert region to boat, fish, hike, camp, and explore this beautiful area. The sea also hosts millions of migratory birds each year. But the sea is in trouble. 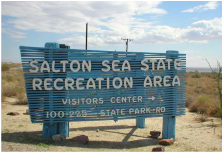 With water levels falling and salinity levels rapidly increasing, wildlife and tourism around the Salton Sea need help. This tutorial covers the glamorous past of the Salton Sea, the tempestuous present, and the uncertain future of this beautiful area. Click the links above to jump to the time you would like to investigate or click the button below to go through the tutorial chronologically.